The Kanagawa Prefecture is located in Japan’s Kantō region and is included in the Greater Tokyo Area (but is not a part of the Tokyo Prefecture). Kanagawa is a comparatively small prefecture, nestled between the foothills of Mount Fuji to the north-west, and the ocean to the south and east, and with Tokyo as it imposing neighbour to the north. The largest city and capital of Kanagawa is Yokohama, a port city on Tokyo Bay. This is Japan’s second largest city and a major commercial hub for the Greater Tokyo Area. Located on the island Honshu. Located in the region Kantō. Is comprised of 6 districts. The easternmost part of Kanagawa is fairly flat and borders to the sea, and this is where you’ll find the large port cities Yokohama and Kawasaki. This part of the prefecture is much more heavily urbanised than the western part, although the south-eastern area, near the Miura Peninsula, is only sparsely populated, and is where you can visit the ancient city of Kamakura, famous for its temples and shrines. The central area surrounds the Tama Hills and Miura Peninsula. Here, you find rivers such as Sagami, Sakai, Tsurumi and Tama. Western Kanagawa, bordered by the prefectures Yamanashi and Shizouka, is at a higher elevation than the eastern part of the prefecture, and dominated by the Tanzawa Mountain Range. The Sakawa River flows through the Sakawa Lowland, between the Hakone Volcano and the Oiso Hills. It’s final destination is the Sagami Bay. Odawara and Hakone are two popular tourist destinations located in western Kanagawa. 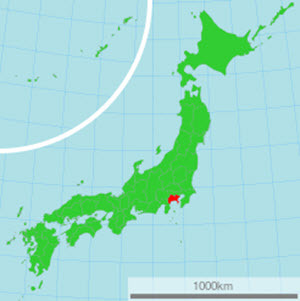 There are two national parks in Kanagawa: the Fuji-Hakone-Izu National Park and the Tanzawa-Ōyama Quasi-National Park. There are also four Prefectural Natural Parks: Jinba Sagamiko, Manazuru Hantō, Okuyugawara, and Tanzawa-Ōyama. The highest point in Kanagawa is Mount Hiru, at 1,673 meters above sea level. This peak is a part of the Tanzawa Mountain Range. Kamakura is one example of a popular tourist destination in Kamakura. Many of the visitors come from Tokyo, since it is fairly nearby. Kamakura is a coastal town famous for its Buddhist and Shinto temples and shrines, and for having many annual celebration events. In the 13th century AD, this was Japan’s most populous city. 4 January Chōna-hajimeshiki (手斧初式) at Tsurugaoka Hachiman-gū. At 1 pm, construction workers carry out a ceremony using traditional tools. (Usually 3 February) Setsubun Matsuri (節分祭) at Tsurugaoka Hachiman-gū, Kenchō-ji, Hase-dera, Kamakura-gū, and other locations. Celebrate the end of the winter by scattering beans into the air. A week long celebration of the city Kamakura and its history. Straw-dolls looking like deer are shot at by poetry-reciting archers dressed like samurai. (or on the following Monday if the 10th is a Saturday) One hour of fireworks display on the beach in Yuigahama. A three-day long festival with numerous activities and exhibitions, including a horseback archery display on the 16th.